When it comes to telling time, Makers like to go beyond simply reading moving hands or looking at a digital display. 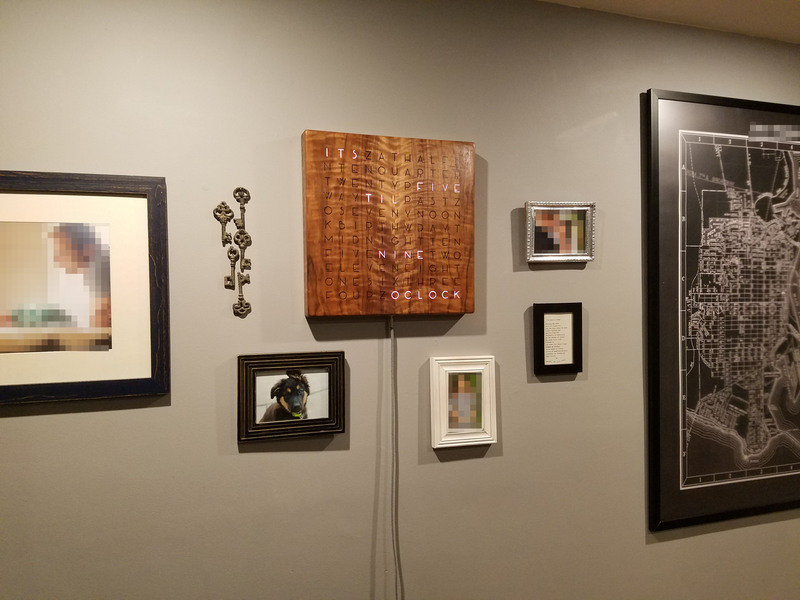 In Imgur user Grahamvinyl’s case, that’s a slick word clock comprised of a walnut veneer, clear epoxy, LEDs, letters, and Arduino. Grahamvinyl cut the clock from the back of an acoustic guitar and sides, and then strung together individually addressable RGB strips. A matrix of letters in Art Deco font spell out the time horizontally. Pieces of spraypainted 1/4-inch MDF act as dividers (so the color doesn’t bleed from one letter to the next), and a sheet of wax paper diffuses the light. I haven’t seen another word clock designed the same way: clear epoxy holds the interior of the letters in place, so I didn’t need to use a stencil font. The Arduino Uno-controlled clock also has a button on its side that allows it to show the numerical time—from far away, you’ll notice the illuminated letters actually create the shapes of numbers. The hours show up dimmer, the minutes brighter. Another push reveals the numerical date in the same fashion. You can even program it to flash a special message on your birthday. Grahamvinyl notes that there are three buttons in total, each wired to an input on the Arduino. Right now, however, only the top one is functional. The idea is to eventually have the bottom two cycle through colors or set the time. Beyond that, the Maker hooked up a USB connection to the clock so that it would be easily programmable. Interested in building your own word clock? Check out more images on Imgur, and find the code on GitHub. Well this is kinda fun to see.